Subject: Why Is Cuban Debt Being Ignored? U.S. and Cuban officials began meeting yesterday to map out plans for the former two Cold War foes to improve relations. Specifically, the talks focus on law enforcement, healthcare, and agriculture. However, when it comes to Cuban debt – an issue that has wracked U.S.-Cuban relations for half a century — officials from both parties are keeping relatively mum. The United States seeks upwards of $10 billion from the Cuban government in compensation for nationalized properties seized in 1960 in the wake of the Cuban revolution. Cuba demands at least $121 billion in reparations from the United States for the imposed trade embargo that has lasted for over five decades. Several U.S.-run entities were seized and nationalized by Fidel Castro. For instance, the Cuban Electric Company has a claim against Cuba valued at about $268 million. Exxon Mobil Corp. (NYSE: XOM) has a claim for $72 million. Coca-Cola Co. (NYSE: KO) for $28 million. Woolworth for $9 million. Even Walt Disney Co. (NYSE: DIS) has a claim in which items like $12,300 worth of color 35 mm feature film prints are listed. Because of these seizures, the Cuban trade embargo ensued. Which, according to current Cuban President Raul Castro, cost the development of the small communist nation about $121 billion in economic damages over the years. In spite of their importance to the relationship, however, alleged debts between the United States and Cuba aren't being resolved. In response to questions last week about whether U.S.-Cuban debt will be broached in this week's discussions, Gustavo Machin, the Deputy Director for U.S. Affairs in the Cuban Foreign Ministry, said simply that he's aware the "claims exist." And yesterday, Cuban Foreign Ministry Chief of U.S. Affairs Josefina Vidal — the talk moderator — told the media "the agenda is quite ambitious," reported Reuters. She also hinted that "talks about intellectual property rights were also in the cards." But intellectual property and physical property are two very different concepts. Cuba has already reached agreements with Russia, France, and Spain on debt forgiveness. In December, creditor nations from the Paris Club agreed to forgive $8.5 billion of debt. 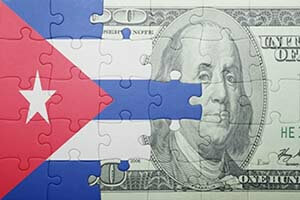 In total, Havana is estimated to have restructured some $50 billion in old debt in the past few years. After U.S. President Barack Obama's March 2016 visit, Cuban Foreign Minister Bruno Rodriguez said "Obama came here to dazzle the non-state sector, as if he wasn't the representative of big corporations but the defender of hot dog vendors, of small businesses in the United States, which he isn't," reported FOX News on April 19. President Castro even labeled the United States as an "enemy" following the commander in chief's visit. All this suggests that it could be a very long time before we see debt between the United States and Cuba resolved.